Menswear has always been focused on the details. Always has and always will. So there is no astonishment that distressed denim look became a fascination of high fashion collections. 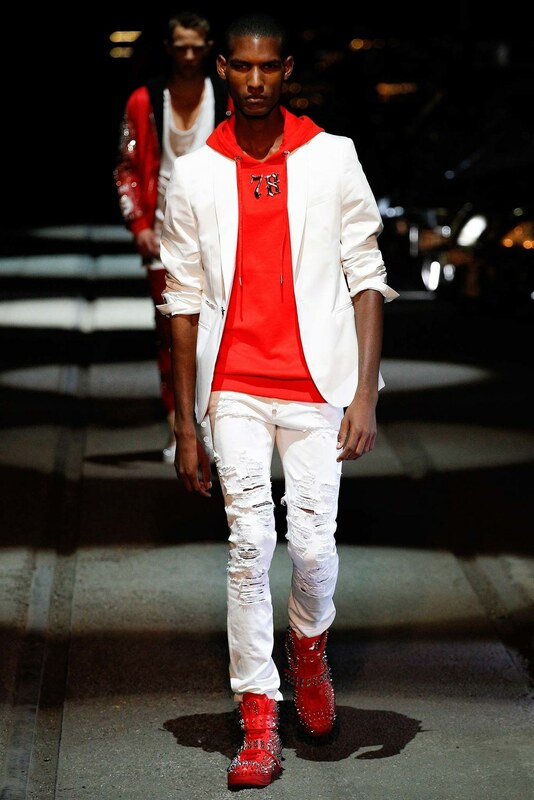 For Spring 2016, Baartmans & Siegel (middle-left), James Long (middle-right) and Philipp Plein (middle-center) carried the look through collections of jeans ripped at the knees, slits running down the leg and patches that remedied gaps of exposed skin. This year, denim is anything but the everyday casual wear. Rather summer’s denim offers a statement, a fashion show from the runway to the streets. The concept should be questioned under considerable scrutiny. Are statements spent for disposable circumstances: shopped to participate and then worn comfortable enough to throw away after a season? Or, are statements similar to opinions: they are available resources to consider and study. In which ever case, in no means are these dramatic designs mentalities suited for everyday. The distressed denim look statement— like any other, famous for the spark of excitement it brings to the essential forms of fashion. 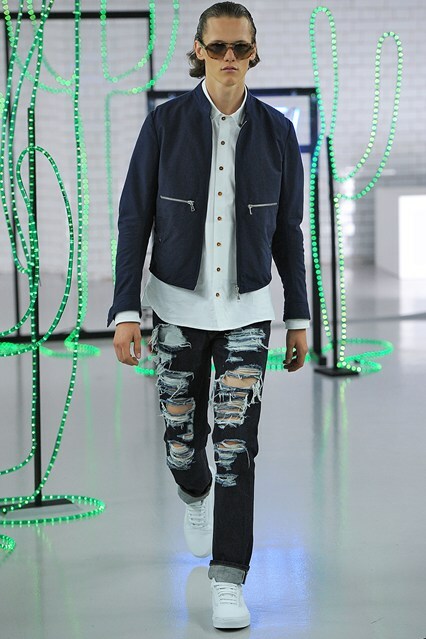 For without the intentional technique of deconstruction and demolishment of the fabric, the pair of jeans would remain atypical. Furthermore, it is with speculation whether the right attention for its statement would have reached potential without it popularity among street style phenomenon. The error in its respect rests in this situation. Without a strong lasting impression, distressed denim has become a self-acclaimed statement made by those who dress with intention of becoming distinguished or popular for parading around in outrageous outfits. Those who choose to fashion the trend, decide to join into a group of cult followers interested in the dramatic, extravagant and over-the top. A pair of distressed denim is an overstated design. In its most demolished form, the denim is removed, resulting in tears of the product and gap holes filled in by the skin of whom fashions its aesthetic. This realm of the industry has its gaze on the trendy, and so current eyes transfix on fast fashion. An appreciation for the pieces of clothing, and the details become a lost cause in the hope that fashion will be appreciated for its technique and point of view. This is the problem. Just as all menswear is concerned, the details are the characterizing quality of this piece of clothing. The placement of the rips is too another component to consider. Many are the styles that follow the most extravagant of them all — product entirely destroyed. The spectrum can lead from small, intentional slits of the denim on the knee cap, a fraying effect at the placement of the thighs, cuts in the fabric trailing the leg, and at its worst, destruction made in full reduction of fabric, resolving in a bare appreciation for the fabric, but rather an strangely interesting look with trendy appeal. Inspired by a genuine attraction for fun fashion, the distressed denim jean too can be abused for the sake of vanity. The ultimate error made for the distressed denim fashion statement is the misrepresentation of its appearance. The prospect for the look becomes sloppy, unprofessional and low quality. The probability for its misrepresentation, an attention seeking, mirage of fashion captivates those hungry for access to fashion. The tasteful, reminiscent sense of style has turned into a tactful strategy for how to incorporate the knee slit, distressed patches, deconstructed denim look. Statements are considered disposable, and if all fashion creations are considered this way, then clothing will loose its charm: the glamour and beauty that inspires replications at its cheapest cost. The problem persists in an access to statements that renders high fashion below the standard of luxury it was created for. 1. Simplify your complements: It can certainly be a fun statement with simple support. Basic t-shirts or hooded sweatshirts are complements — the simpler, the better. Distressed jeans are most commonly worn in conjunction with graphic t-shirt, and on other days, classic pieces with embellished. At times these paired pieces can over-style an outfit. To ensure the distressed denim is leading the fashion statement, match this pair of denim with uncomplicated designs. A pullover or Henley are other alternatives. Be sure to stay away from rugged, vintage appeased styles, for these tend to overextend the impact of the distressed denim. In circumstantial situations as so, simplicity is key. This is the golden rule of styling. Consider the simplicity of Kanye, Scott Disick or Pharrell as style references on how to incorporate the look. 2. Wear under Appropriate Circumstances: May fashion be full of fun, expressing your perspective in ways words fail. To ensure the best representation, present the jeans as a piece of your personality in the right moments: parities and Friday nights out. These are the events where making a statement will add excitement to the high-energy environments. Mindfulness for when the holy jeans appear as unholy, in professional and conservative environments will create a better opportunity for personal expression. 3. Invest: Statements are an investment, not an opportunity to splurge. Quality clothing is fashionable, but it will cost the extra penny. The most successful recreations of trends are produced with quality material and precision, these crafts are worth funding. Additionally, remember to focus on the details. Consider the amount of distresses against the product. The manipulations of the fabric will weigh the investment. If the style and function of the product suits various facets of your lifestyle, consider it an investment. So in the decision to fashion the statement, the only distress should showcase on the jeans.